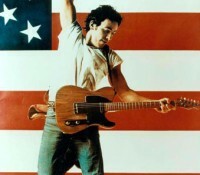 Great songs….foundational songs…songs that made me (and still make me) want to be a songwriter. Yeah, just invented rock n’ roll today. Then I still had to get through the rest of my life. And, cue heaven out of hell. What do you even say here? Don’t think I’ll ever quite digest this. How did they do this? It’s really just synth drums and Jessie. And ripping Prince in all the right ways doesn’t hurt. Hats off Ms. Ware and Mr. Blanco! So good. If not, then why we doing this? This one gets there…. At the time this sounded like it was made out of plastic. Every year it’s heart gets warmer, stronger, bloodier. Never under estimate this man. Arcade Fire’s Grammy grew from this seed. Man, he’s cool. I don’t care if it’s lip synch. Has anyone ever gone out with this much juice after so much brilliant road behind them? Hoping that harmonica is playing you out into a new career in a new town. Love of a billion suns. How Lucky Can One Man Get? This song kinda just repeats over and over. I don’t understand it any better at the end then I do at the beginning. But man it gets better an better. John Prine is antifragile. My love, I see you walking down a spiral staircase to this and blowing the roof off the place. This sounds like you in all your beauty and power. Love you. My lord. I believe now. Sorry Rabbi! And check that sling which is cooler than my entire wardrobe. I Could Never Take The Place of Prince…. She doesn’t sound like she wants to settle down. But the listener can sure wish. What a fun song. One of my personal/professional highlights was getting to record this…. You’re 13 and just received this on a mix tape from the boy you like. Put on your walkman and walk out into the woods. Wave at the goth girls and walk on by….it ain’t all bad. This one keeps giving over 40 years later. Surprisingly sturdy legs. Strange how truly great songs often have an element of the ridiculous, no? Not that many artists live up to their promise. The promise of “Passionate Kisses” is a high bar. Thanks Lucinda for going deeper over the years and keeping your heart wide open in the darkness. © 2016 Paul Schneider. All rights reserved.